Vehicles with built-in LTE connection will pull information from the traffic signals. We’ve all sat at a red light that seems to take ages. Concepts for ‘hourglass’ traffic lights make impatient drivers optimistic, along with news that, someday, autonomous cars might make traffic signals altogether obsolete. That’s Audi’s plan. The company recently announced it’s going to start working with municipalities to tell its cars when a light is about to turn green. The automaker says this is the first step in a Vehicle to Infrastructure (V2I) partnership with cities that will be launching this fall. Each car will use its built-in LTE connection to get information from a participating city’s central traffic control system. Using that data and GPS, the cars will be able to show on the dashboard when an upcoming signal will turn green in a countdown format. 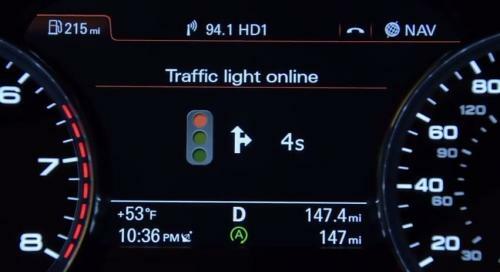 The 2017 Audi Q7, A4 and A4 Allroad vehicles built after June 1, 2016 have the technology to communicate with traffic signals already build in. Drivers will also need to subscribe to Audi Connect Prime. The other catch? Audi isn’t divulging where the new V21 infrastructure will roll out first. Audi hopes the system will be working in five to seven metropolitan areas by the end of the year.